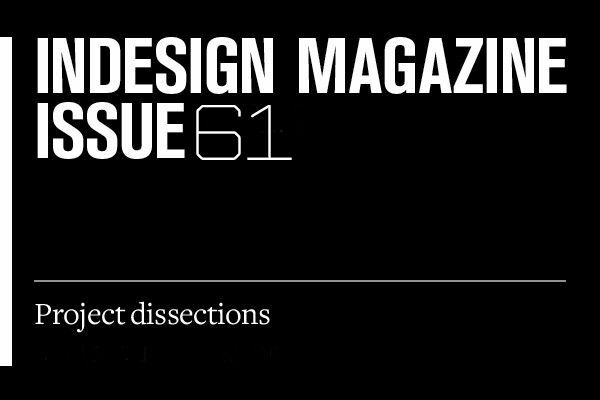 A full directory of the contact information for every company referred to in the project dissections of Indesign Magazine #61. Office and meeting chairs, ‘Diami Ezitask, ‘Zen’, and workstations throughout, Zenith. Internal meeting chairs, ‘Cinto’, Schiavello. General office and arm chairs, Billiani ‘Croissant Lounge’, Café Culture + Insitu. General office chairs, CULT. Collaborative setting generally throughout, Work Arena. Meeting and boardroom tables throughout, ‘Thinking Ergonomix’, Stylecraft. General office tables throughout, ‘Pinochio’ and ‘Steffano’, Café Culture + Insitu. 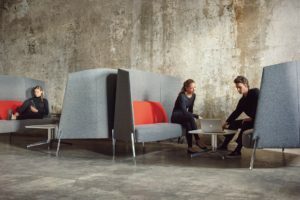 Workbays, ‘Vitra Workbay Work 2’, ‘Vitra Alcove’ two seater sofa, Unifor. ‘Tolomeo’ desk lamp, suspension lamp, Artemide. 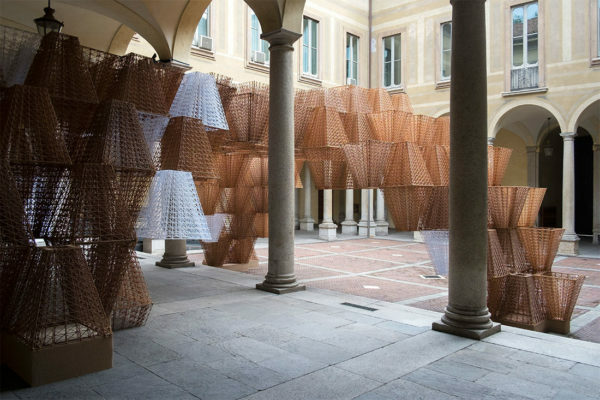 Molo ‘Cloud’ floor/table softlight, SeehoSu. Flos ‘Tatou’ standing lamp, Reggiani. LED luminaire, Wästberg ‘Sempé’ pendant lights, Euroluce. ‘Fusion T5 SRS’, Pierlite. Delta Light ‘Streamer L EVG’, Delta Light ‘Topix’, Delta Light ‘Supernova’ ceiling lamps, Inlite. ‘Archiline’, LED Lighting. Recessed ceiling light, Zumtobel. Hive ‘Constellation’ chandelier, ‘Samba’ hanging light, Ke-Zu. ‘Seams’ pendant, ISM Objects. Pendant light, Coco Reynolds. Graypants ‘Scraplight’ pendant lamp, ECC. Foscarini ‘Big Bang Suspension Lamp’, Space Furniture. 905 Lighting series, 3S Lighting. Assorted architectural lights, Light Project. Recessed downlight, Litesource. Rugs, Designer Rugs, Dinosaur Designs. Raised access floor system, Tasman Access Floors. Aluminium throughout: Saphire Aluminum, Dulux. Carpet tiles throughout: Above Left, Interface. Solid timber throughout: Eco-Core and by joiner. Timber veneer generally throughout, Briggs Veneers. Vinyl flooring throughout, Altro Flooring. Furniture linoleum: Forbo. Vinyl film glazing, Sunscreen Window Tinting. Bench top granite, Granite and Marble Works. Tiles throughout, Academy Tiles. Laminate generally throughout, Laminex. Black laminate, ‘Crea Metal’, Halifax Vogel Group. Stainless steel throughout, Stainless Sections. Aluminium Panelling, Symonite. White colour backed glass, Palmers Glass. Translucent Grey Glass, Viridian Glass. Paint throughout: Dulux. Panels throughout: Europanel, Woven Image, Autex. Fabric upholstery generally throughout, Kvadrat Maharam. Leather throughout, Contemporary Leathers. Banquette seating upholstery, Sparkk. Guestroom, Nub chair, Living Edge. ‘Kelly’ small round ottoman, ‘Sidney’ coffee table, Jardan. ‘Triple’ table, Oak and Elm. Generally throughout, ‘Tom Dixon’ table lamps, Dedece. 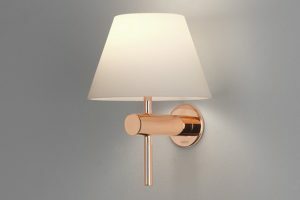 Guestroom, ‘Touch’ wall lamp, Ross Gardam. Bar, ‘Life Space Journey’ pendant lights, Café Culture + Insitu. 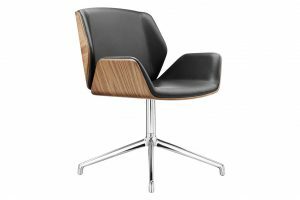 Upholstery – generally throughout, ‘Ascona Leather’, Pelle Leathers. Guestroom, ‘Belting Leather’ luggage rack, Spinneybeck. Wall panelling and interior, Dulux. ‘Torridon’ carpet, Victoria Carpets. ‘Segre’ sheer curtains, Materialised. Bathroom, ground floor ceiling over bar, partitions and doors, and waiters’ station, Project Group. Bistro and bar, ‘Calacutta Caldia’, The Stone Boutique. ‘Cavalier from Pegasus’ sheer curtain, Mokum Textiles. Guestroom bathroom, Penny round tiles, Academy Tiles. Tiles throughout, ‘London’, Signorino. Flooring throughout, ‘Venture Planks’, Havwoods. Restrooms, ‘Berlin Three’ basin, Studio Bagno. ‘Icon+’ tapware, Astra Walker. Guestroom, ‘Zero50’ basin, Rogerseller. ‘Vivid Slimline’ basin mixer, ‘Porcher Cygnet’ twin shower, Reece. Joinery leather handles, MadeMeasure. Generally throughout, ‘Satelliti’ workstations, Unifor. Schiavello ‘Centric’ workstations, Vitra ‘Joyn’ workstation, Schiavello. ‘T Platform’ workstations, Bene. Breakout Area, Ritzwell ‘Rivage’ easy chair, Stylecraft. Minotti ‘Cesar Mod.B’ side table’, Marquis. Pedrali ‘Matrix’ console, XTRA Designs. Meeting Room, Carl Hansen & Son ‘Wishbone’ chair, Space Furniture. Thinking Ergonomix ‘Edge’ table, Stylecraft. Work areas: ‘Aeron’ chairs, Herman Miller. Custom round work tables, Bene. Lounge: Andreu World ‘Nub’ chair, XTRA Designs. Jardan ‘Olba’ table, BW Furniture. Custom stool, Sofa+Others. Muuto ‘Dot’ coat hook, Dream Interiors. Common areas, Vitra ‘Hal’ wood chair, Schiavello. Pantry, Capellini ‘Capo’ chair, Dream Interiors. 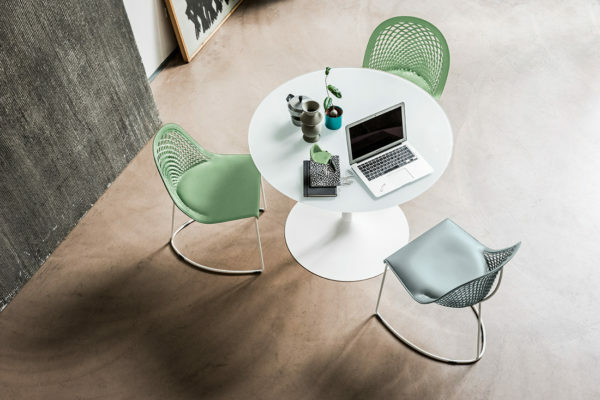 Vitra ‘Nest’ table, Schiavello. 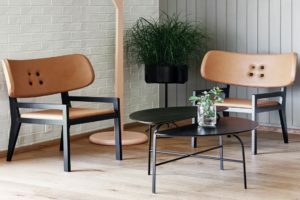 Billiani ‘Aloe’ bar stool, Café Culture + Insitu. Cafeteria, ‘Feel Good CL326’ armchair, Stylecraft. Custom stools, custom dining tables and bench seats, Sofa+Others. Jardan ‘Flynn’ table (large), Hay ‘J04’ chair, BW Furniture. Ton ‘No.30’ dining chair, XTRA Designs. Punt ‘Nucleo’ table, Pomelo. Generally throughout, ‘Faewoo’ LED sheet lamps, Nadir. Meeting Room, Tom Dixon ‘Beat Light Fat’, XTRA Designs. Cafeteria, LUMA textured glass Lamp, E-Lume. Generally throughout, Paint, Akzo Nobel. ‘Zulu’ curtain system, Kvadrat. Breakout areas, ‘Utopian’ and ‘Sceptor II’ broadloom carpets, Shaw Contract Group. Work areas, ‘Tretford’ carpet, Goodrich Global. ‘Hallingdal 65’ upholstery, Kvadrat. Common areas: ‘Ceramica Vogue’ tiles, Kian Wah Hung. Lounge, Euro Oak engineered wood floor, Wood & Wood. Semi-Aniline Elmosoft Leather, Elmo Leather. Cafeteria, patterned tiles, Hup Kiong Pte Ltd. Discussion Rooms, ‘Synops’ glass partitions, Clestra. Work areas, artificial and live Plants, Ecoflora. 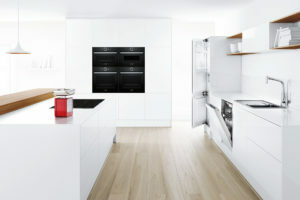 Pantry, refrigerator, Fisher & Paykel. Microwave oven, Bosch. Above banquette seating, ‘T_Mini’ surface mounted lights, Artefact Industries. Custom light pole, wall sconces throughout, ‘Dioscuri’, Artemide. Front counter, Display case, Laminex. Kitchen throughout, Dulux. Concrete bench top, Wellhard Concreting. Tiling throughout, matte and gloss wall tile, Perini. Gloss wall tile, Tilefix. Gloss wall tile, Designer Stone Solutions. Moulding to bench upstand, half round timber dowel, Porta Mouldings. Upholstery, navy blue bar stool, Action Powder Applicators. Leather bar stool, Pelle Leathers. Store frontage, bar top and banquette seating, solid Blackbutt timber. Generally throughout, furniture and appliances, Southern Hospitality. Banquette seating, Image Interiors. Generally throughout, lighting, Beca and, Zumtobel. Feature lighting, Matisse. Generally throughout, Tiles, leather, granite, oak posts, Design Source. Countertop finishes and oak flooring, Image Interiors. Generally throughout, Paint, Resene. Epoxy resin floor, Flocrete. Wall cladding, Tata Rimex. Mud plaster walls, Ambitec. Upstairs and balcony: Sentosa Designs. Antiques throughout, Glebe Antiques. Custom furniture, Country Furniture Design. Barstools, Canalside. Generally throughout, Dunlin Home, Circa Lighting, Restoration Lighting, KODA Lighting, Orson and Blake, Euroluce. Paint, Porter’s Paints, Dulux, Resene. Timber, Northshore Timber and Hardware. Tiles, Bisanna Tiles, Belmondo Tiles, Colortile, Olde English Tiles. 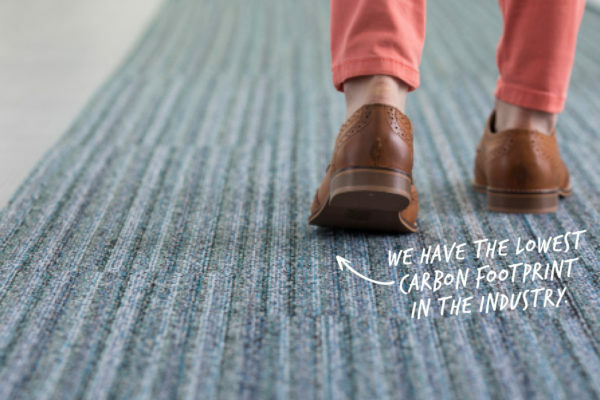 Carpet, Natural Floor Coverings. Bar countertop, Halifax Vogel. Leather Upholstery, Pelle Leathers. Kitchen Floor Tiles: Metz Tiles. Floor Tiles: Di-Lorenzo. David Caon ‘Caon Stool’, ‘Vantage Chair’, Matzform. Maruni ‘Roundish Chair’, SeehoSu. Michael Young ‘Bramah’ floor lamp, table lamp, pendant lamp, EOQ. Carpets, Tai Ping Carpets. Polished concrete, Optimix. Tiles generally throughout, Pacific Building Material, Cement Tile Shop, EPS Building Supplies, Kale Italia. Upholstery fabric, Kvadrat. Leather, JMT Leather. Throughout suites: Laval S.A., Robert Wolfe & Partner, Cassina S.p.A., Decca Furniture, Rosello, Taylor Llorente, JNL Collection, Christopher Guy, Molteni, Matteograssi SRL, La Ferode, Dennis Miller & Associates, Se London, La Fibule, Margo Glass Gallery, Dorya Interiors, Hifigeny, Asiatides, Mecox Gardens, APF Group, William Switzer & Associates, Baker Furniture, Jacques Carpentier. Cigar lounge round table, Dessin Fournir. Service trolley, Jan Showers. Bar cocktail tables, Interna Collection. Bar armchairs, Hugues Chevalier. Level 6 restaurant dining chairs, Dakota Jackson. 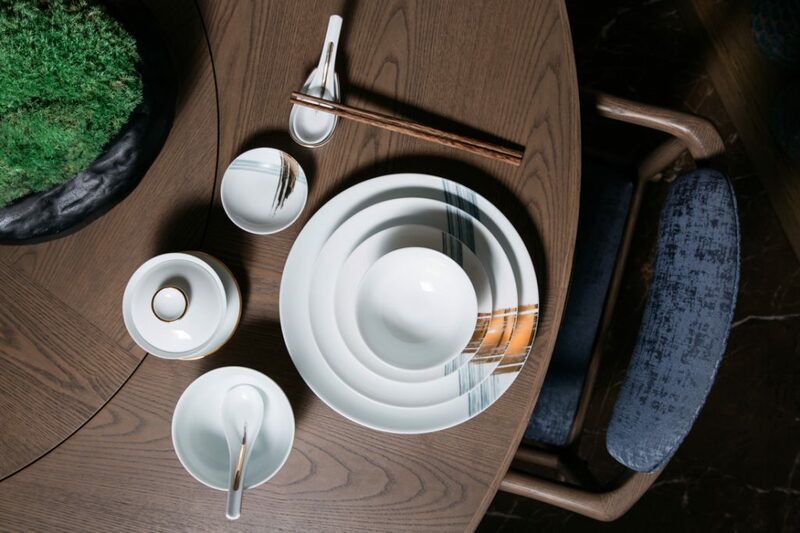 Chinese restaurant: coffee tables, Lily Jack. High pedestal, round flower table, Spa planter, Willow Group. Meeting room sofa, Studio Putman. Spa ottomans, Plantation. 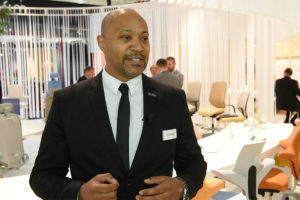 Throughout suites: Debbas France S.A.S., Vistosi, Hudson Valley Lighting, Targetti Poulsen, Jean Marc Fray, Italamp, J. Robert Scott, Barovier & Toso. Living room pendant lamp, Peninsula suite and lobby chandeliers, Andromeda International. Floor lamps, Ricardo Lighting Company. Dining chandelier, public corridor chandelier, Baccarat. Dressing wall scones Devon & Devon. Lobby: ‘Dancing Leaves’ light fixture, Lasvit. Bar table lamps, Inedit Lighting. Level 6 restaurant floor lamp, Authentic Models BV. Public corridor wall sconces, Foscarini. Upholstery – fabric generally throughout: Pepe Penalver, Altfield Interiors, Integra Fabrics, Kravet, Cetec, Dedar, Janus, Sankon, Pierre Frey. Katara suite rug, Tai Ping Carpets. Leather upholstery in Katara suite: Tiger Leather. Level 6 restaurant and spa rugs, Carpet Point. Peninsula suites: fireplace guard, Nimrod. ‘Invader QR-CBC’ ceiling mounted downlights, Light Project. ‘Bunker Cage’, bulkhead lights, external wall light, Fat Shack Vintage. ‘Seaside Cottesloe’ internal wall lights, Oz Lighting. Pendant lights, Inkster Maken. Wall arm light, WO & WE Collection. Generally throughout: Paint, Dulux. Bar top: Grey ironbark, ‘Matt Syntenko’ finish ECO Timber. Furniture frames throughout: ‘Penetrol’, Barnes. ‘Duralee’ vinyl upholstery, Laine. ‘Antiquita II’ brass mesh bar overhead, Locker Group. Lighting throughout, TM Lighting, Deltalight, Klus, Meyer, Inlite. XAL, Space Lighting, Space Cannon, Lightmoves, Artemide, Dynalite, ERCO, KKDC, Osram, 3S Lighting, Xicato. Carpets throughout, TSAR Carpets. Retail Areas, ‘White Pearl’ marble stone floor, Apex Stone. ‘Gunmetal’ display joinery metal, Resene. Black mirror sales counter metalwork, Rimex. ‘Armourcoat’ plaster wall finishes, Multicolour Australia. Smoke mirror wall finish, Viridian Glass. Customer bathroom, ‘Bisazza’, Apex Stone. Mirror ceiling, Laminex. Suspended chainmail ceiling, Screens & Fireplaces Australia. Staircase, Dunsteel. Wall-faced toilet suite and wall basin, Caroma. Sensor tap, Enviro-Tech. 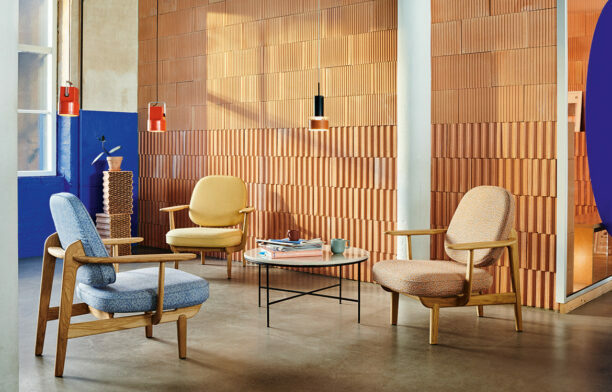 ‘Nest’ armchair, ‘Sledge’ lounge chair, ‘Lounge’ armchair, ‘Bergere’ armchair, ‘Throne’ bar stool, ‘Throne’ outdoor chair, ‘Cloud’ table, and custom furniture generally throughout, Autoban. Generally throughout, custom architectural lighting, Ecres. Custom decorative elements, Autoban. Walls and floors generally throughout, Belenco. Generally throughout, sanitary products, VitrA. Fittings, HansGrohe Axor Citterio. Urinal, toilet installations, Grohe. Workstations, folding, meeting table 1, and computer tables throughout, Schiavello. Children’s table, coffee tables, study table and communal table, chairs, lounges and stools generally throughout, KFive. Staff lunch tables, study desks, meeting tables 2-5, ‘U.R. Table’, Thinking Ergonomix. Storytime Space, ‘Vitra Panton Junior’, Space Furniture. ‘Magis Puppy’, CULT. ‘Vitra Eames Elephant’, Unifor. External Furniture, ‘Aura Pebble’, Zenith; ‘Alby’, Jardan. ISM Lighting, Klik Systems, Eagle Lighting, Pierlite, Vela, Moonlighting, Masson for Light. Upholstery throughou, Instyle Fabrics. Carpet throughout, Shaw Contract Group. Stone flooring, Fibonacci Stone.